A map shows the locations of recent shark sightings in Orange County. DANA POINT, Calif. (KABC) -- Great white sharks were spotted at Doheny State Beach, which makes four shark sightings reported in Orange County this week. Harbor Patrol officials said beachgoers were told to get out of the water on Tuesday due to a number of great white sharks spotted in the area. The shark was estimated to be about 10 to 12 feet long, and its markings resembled those of a great white. Also, two juvenile thresher sharks were spotted swimming off the coast on Monday. However, Doheny State Beach remained open, and several surfers were out on the water early Wednesday morning. 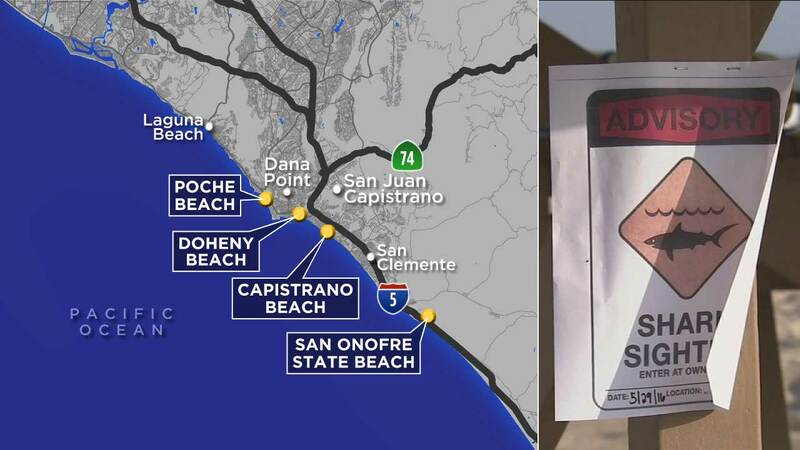 Sharks have also been sighted at Poche Beach, Capistrano Beach as well as San Onofre State Beach, where a woman was bitten last weekend. She remains in a medically induced coma. Last week, a great white shark was spotted off the coast of Dana Point feeding on a dead humpback whale. Video captured a great white shark feeding on a dead whale off the coast of Dana Point.